I'm a huge fan of mops. 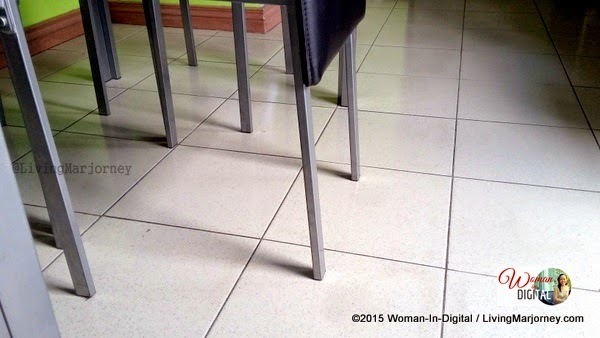 I clean/mop the floor twice a day and it makes me happy to see and feel spotless, clean and smell fresh home. Then, I would remove my slipper and feel the cleanliness of the floor. I would tell myself "this is home!". So I'm really glad there are floor mops that make cleaning easy and efficient. 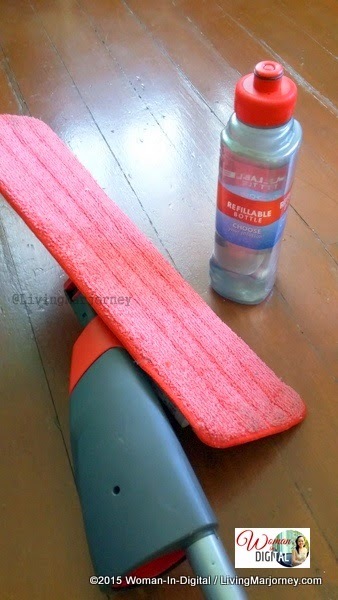 It's been two weeks now since I started using Rubbermaid Reveal Spray Mop. I've been using a different type and brand of floor mop, it made life easier especially for busy women. 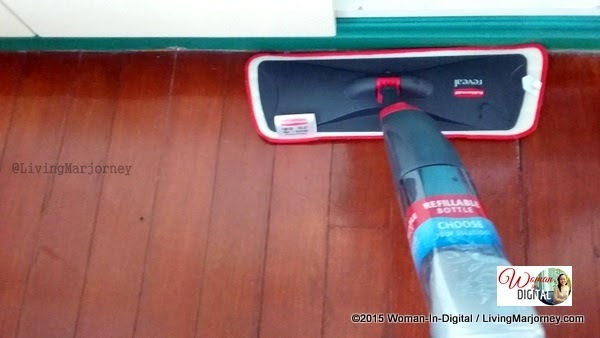 With my new Rubbermaid Reveal Spray Mop, I found several reasons to love it. First, it's durable and made of high quality material. It's an all-in-one spray mop. It comes with a refillable bottle, a large microfiber pad that's securely attached to the bottom of the mop. What I like about this product is the red pad which is reusable, washable and easy to clean. You can just toss to your washing machine and clean it but I don't do that. My washer is just for clothes so I prefer hand washing cleaning pads, rags and wipes. Anyway, I'm using gloves every time I do the laundry. The big feature that caught my attention is the refillable bottle. 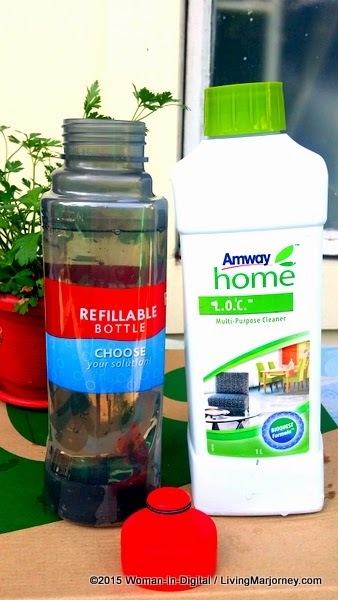 At the moment, I'm using Amway HOME cleaning solution. I like because it easily removes dirt, dust, and makes floor shiny. It has non-irritating smell too. You can also make you own home cleaning solution and put it in the refillable bottle. The bottle is easy to remove and refill. 1. Place desired home cleaning solution on the bottle. Fill the bottle with water and add desired cleaning solution. 2. Place and secure refillable bottle on the Reveal Spray Mop cavity. 5. It swivels and can rotate, can reach under. The wide, non-scratch microfiber pad makes cleaning easy and fast. 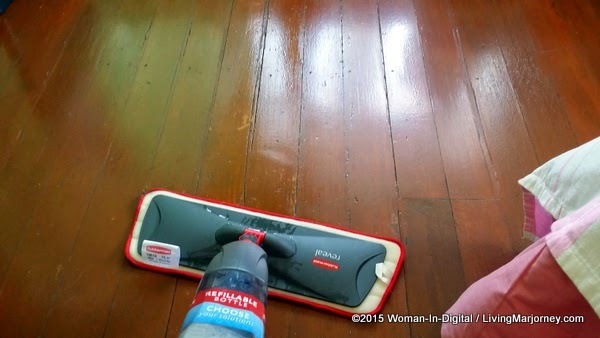 I don't have to worry scratching our wooden floor with Rubbermaid Reveal Spray Mop. It swivels, rotates and can clean even hard to reach areas so you don't have to move huge and heavy furniture.